Today was Day #14 of Chocolate and Brazil Theme Weeks. Arete Fine Chocolate (Milpitas, CA) recently launched their bean-to-bar chocolate offerings. This week I tried both of the company's single origin dark chocolate bars carefully crafted from Brazilian cacao beans. 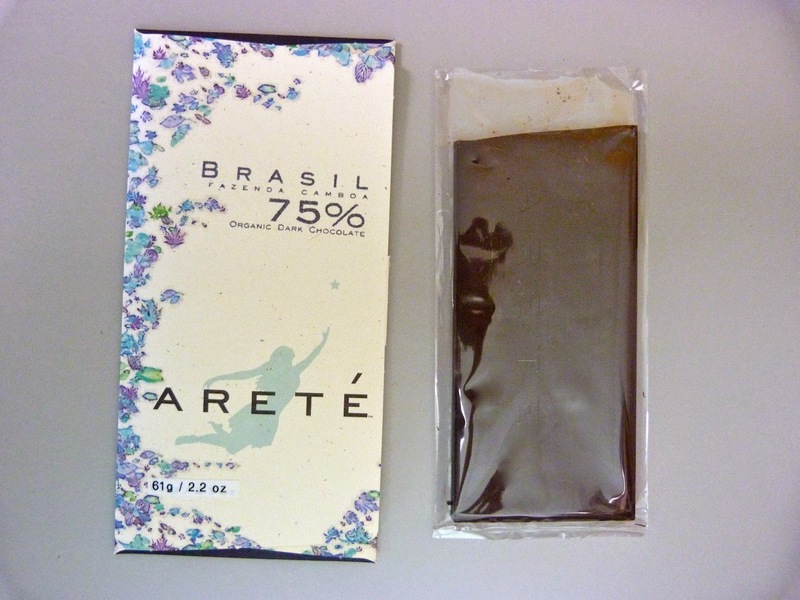 Today's Arete 75% cacao dark bar was made with organic cacao beans from Fazenda Camboa (a large organic farm/plantation in the state of Bahia, Brazil). This bar was made with the same beans as yesterday's 70% dark roast bar, but tasted slightly less sweet, and slightly darker. Hard to tell them apart unless you're eating them side by side. Both Arete Brazil bars had a pleasing chocolatey aroma, broke with a hard snap, and had a complex but well-balanced flavor profile. As I re-tasted this 75% medium roast bar throughout the day and evening, different flavor notes came forward. I got more of a slightly bitter jungle flavor than yesterday's 70% deep roast bar. And at certain times I picked up a few tropical fruit notes (lychee + peach/nectarine), citrus caramel. Cacao beans are a bit like coffee beans -- both are surrounded by a fruit, and are fermented, roasted and ground before they are consumed. However, cacao beans need to be roasted more carefully -- often at slightly lower temperatures and for less time than coffee beans. Also cacao beans have a light husk surrounding them that can be flammable, and that isn't winnowed away until after beans are finished roasting.